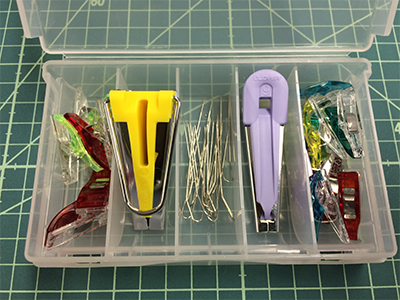 Have you ever tried to use our Mini Wonder Clips? They can be used for patchwork and sewing and have a good reputation. Art No. 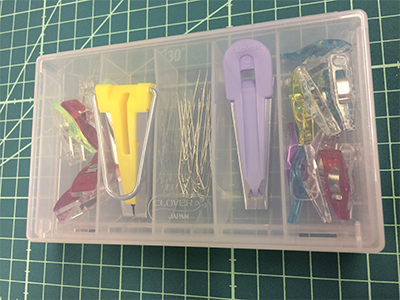 3189, Mini Wonder Clips <50 pcs.> are in a box with 5 partitions. 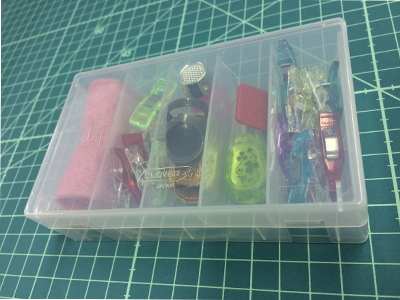 Now, try to store some tools in a case. 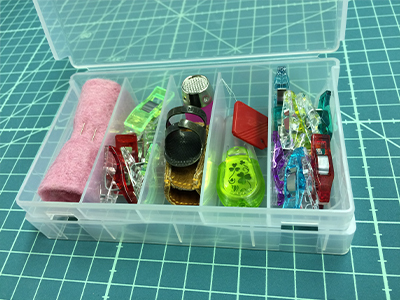 You can organize your own mini box with your favorite tools. A Testament To Ancient Wisdom "HERA"
and the appliqué model (Art. No. 4002). The kimono has been used as both everyday and celebratory clothing since ancient times. Today too, it is used as celebratory clothing on a variety of occasions. The kimono has some cotton included in it, but most of the garment is made from silk material. A kimono is not only decorated by hand, it also uses myriad colors, has woven scenes, and always features an elegant, intricate pattern. Its tailoring is also done very carefully, and requires highly refined technique. 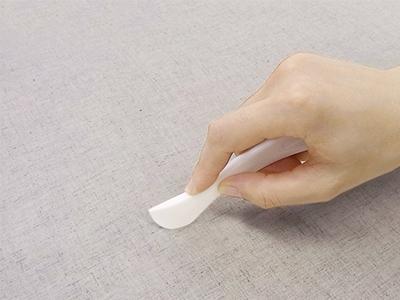 The "HERA" is a tool that has long been used to mark the fabric during the creation of a kimono. Rather than using pigment of chalk to mark the fabric, a mark that shines is created using pressure from a hera. To invent a tool that leaves a mark, yet does no damage to the fabric, is certainly a testament to ancient wisdom. 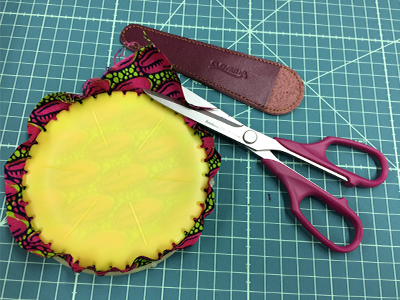 Clover has arranged the "HERA" to be useful in a wide range of ways, including sewing, patchwork, and quilting. Art. No. 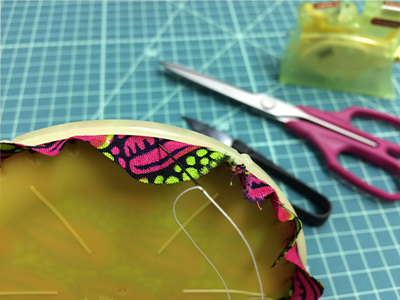 490/NV is convenient for use in marking seams. 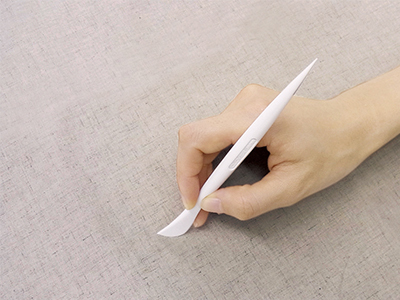 Made from urea resin, the hera has an easy-to-hold handle, and its shape makes applying pressure a breeze. In addition, because the portion that is marked is thinner, it is very convenient when marking thin lines. Using the hera is harmless to fabric, and leaves no fold. The hera is used by pressing it to leave a mark in the desired location. Two tricks are to leave a space for straight lines, and to make curves by making several small indentations. Art. No. 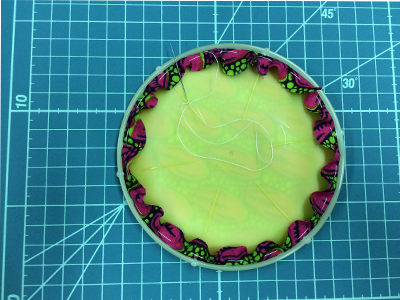 4002 creates beautiful curves, making it a wonderful tool for seams in appliqué. Its thin tip and ideal "HERA" shape allows it to turn perfectly for appliqué and reverse appliqué marking. 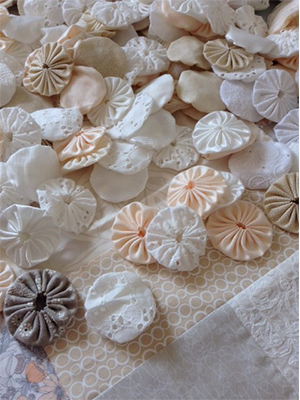 The Clover "HERA" is an indispensable item for quilting. 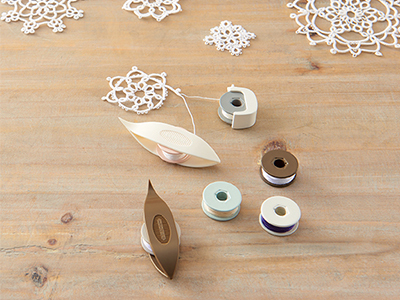 The allure of tatting is undeniable. To confirm that just sit down in the presence of any large group, pull out your tatting shuttle and start putting rings and picots together. You will immediately have a whole host of new friends all wanting to know exactly what you are doing. What is it, how do you do it, where can I get it or where can I learn how to do it? Tatting itself is a relatively new art form that is currently enjoying a genuine resurgence in popularity. With just a little practice even a novice can produce amazing lace creations and it’s surprisingly simple. Whether following a published pattern or leaning to your own creative schemes, tatting is comprised of making and arranging patterns of rings and chains and picots. But those simple rings, chains and picots produce beautiful objects that have applications to every needle art genre imaginable. So what’s not to like? Here’s what’s not to like. All the housekeeping. 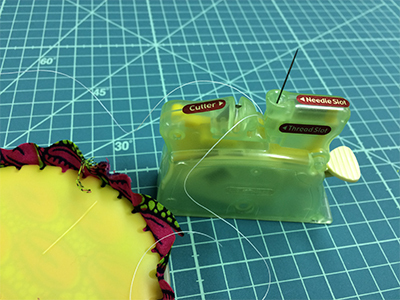 Traditional tatting shuttles require that you wind thread on to them before you can actually start tatting. If you want two or more colors you’ll need two or more shuttles. 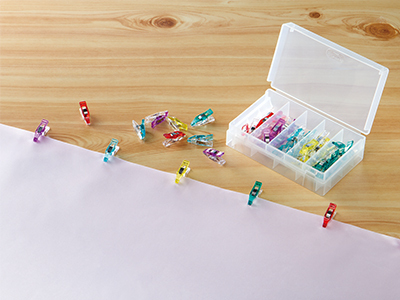 Or what if you’re doing a very large project requiring a lot of thread? More tatting shuttles required or you have to stop often to rewind the one in use. 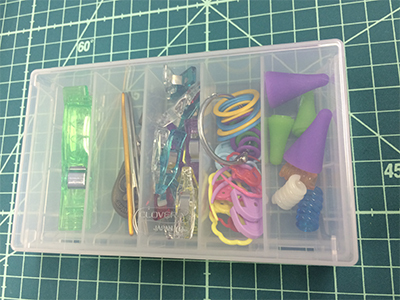 And where do you keep all of your thread supplies while you’re working? Like I said, a lot of housekeeping. Is there an alternative? Of course, we’re talking Clover here. They always have the solutions to enhance your creative instincts. 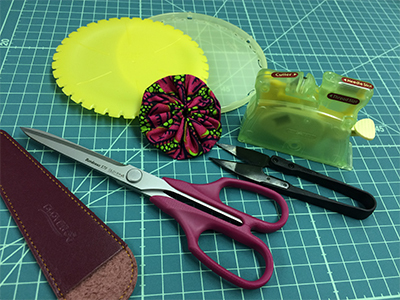 To assist you in your pursuit of all things tatting, Clover has developed an actual system of tatting products. 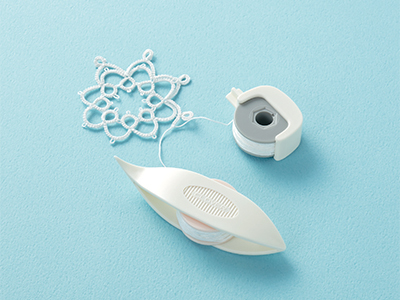 Improving on the traditional tatting shuttle, Clover’s new Bobbin Tatting Shuttle allows you to wind your thread on a separate bobbin and then just insert it into the shuttle when needed. No longer do we need to wind our thread onto the shuttle itself. We can pre-wind as many bobbins as necessary in as many colors as necessary and all well in advance of beginning our project. 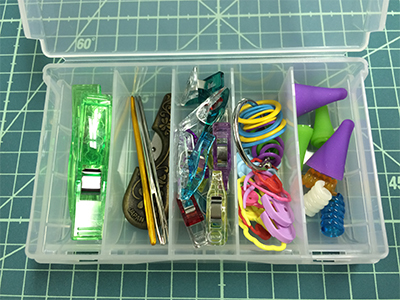 And when you feel the urge you can just sit down with your Clover Bobbin Tatting Shuttle and accessories and get it on with your creative self. 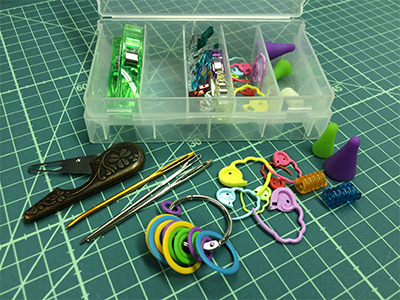 Clover Bobbin Tatting Shuttles are a dramatic improvement over traditional “post shuttles” simply because we can now pre-wind our thread onto any number of bobbins in any number of colors and then simply insert them as needed. 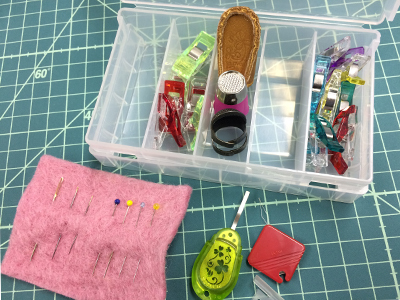 The kit comes with one bobbin shuttle, two bobbins and a convenient “winder/keeper” which doubles as handle to assist us in winding our thread on the bobbin. 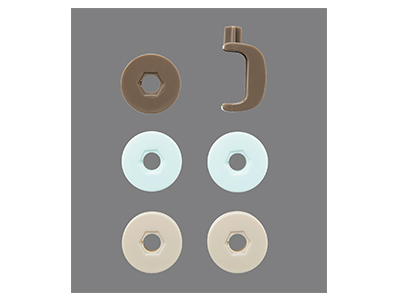 Bobbin shuttle kits come in two colors, white and brown. 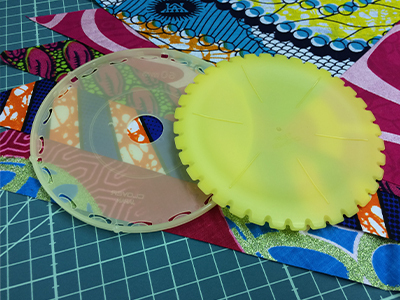 The requirement for more thread or more thread colors is often proportional to the complexity or the creativity of our project. And right in the middle of a complex or developing project is the definitely not the time we want to stop so we can wind shuttles or bobbins. 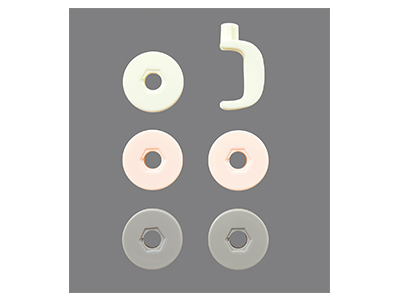 To ensure that you have sufficient pre-wound bobbins for your project, Clover provides a Clover Spare Bobbin Set. 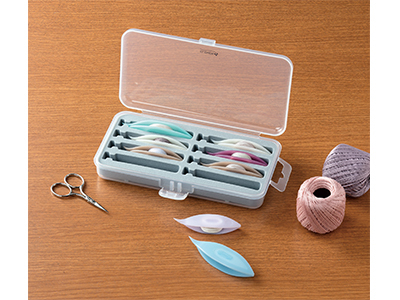 The set consists of one “winder/keeper” and five spare bobbins to meet all of your pre-wound thread needs. The sets are available in brown or white. 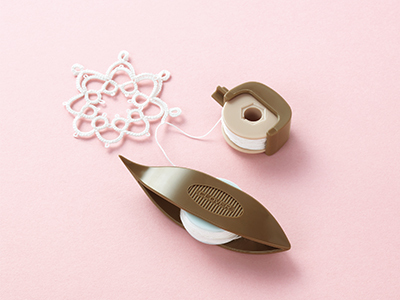 The bobbin tatting shuttle is a great idea, pre-wound bobbins are a great idea, the “winder/keeper” is a great idea. So where do we keep them? We all know that if something is small and not attached to something else it will get lost. 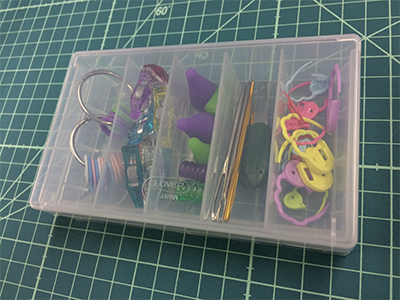 To alleviate any potential anxiety you might have about the location of your shuttles or bobbins, Clover has produced a storage case that can hold four bobbin tatting shuttles and eighteen bobbins. 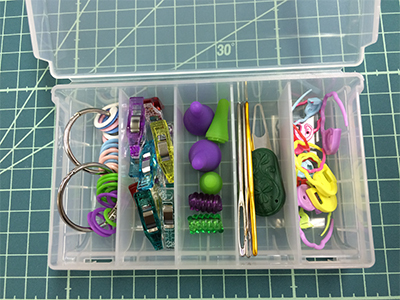 With this storage case all of your tatting materials are in one convenient location. 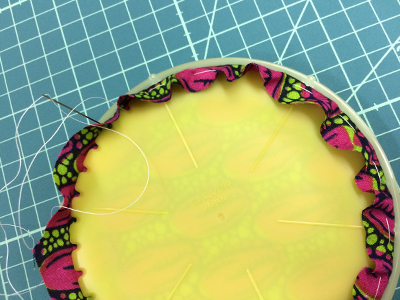 The clear plastic lid also ensures that all of your pre-wound thread colors are easily in view. And it’s the ultimate in portability. Grab it and go. 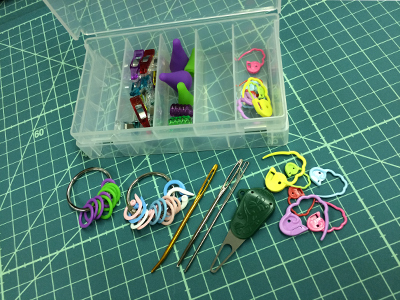 All of your tatting tools are with you. If you’re into the traditional “post” style tatting shuttle we have you covered for that as well. 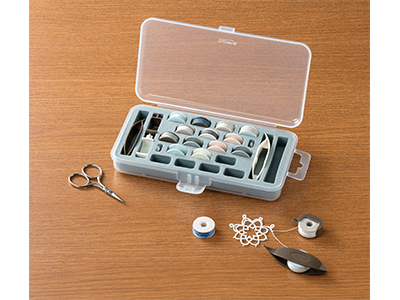 Clover’s storage case for tatting shuttles can carry eight tatting shuttles. The allows you to store eight pre-would tatting shuttles in as many colors as you might need. The clear plastic lid keeps all of the colors easily in view. And again, it’s portable. Tatting has applications to all needle art genres including fashion, heirloom, home decor or jewelry. And it really is an intriguing art form. But it looks more difficult than it is. All you need to promote this thread art skill is to provide a hands on class. Once everyone experiences the creative potential of tatting they will find ways to apply it to any art form that they desire. This is a try it and you’ll like it skill. We’ve said this before, tatting is a beautiful needlecraft art form with great appeal and unlimited creative potential. People who enjoy patchwork quilting know that to create one quilt takes an amazing amount of repeated threading. 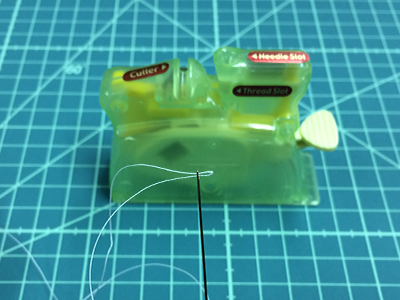 Threading a tiny needle with a soft thread is a tough job for the most experienced artist. 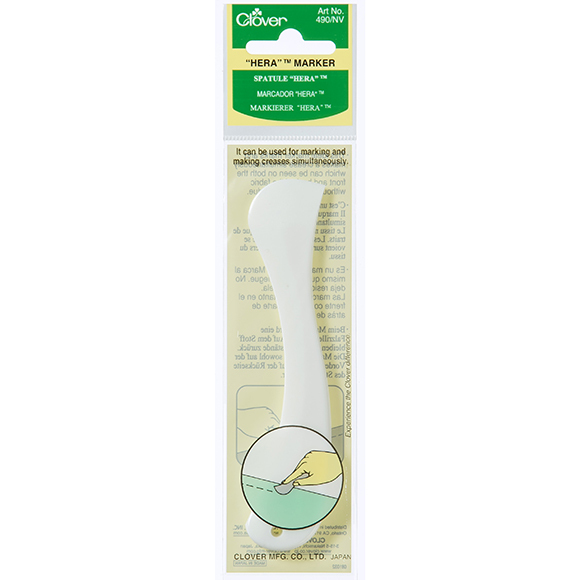 As a manufacturer of fine needles, Clover has long strived to create a needle-threading device that combines the important elements of simplicity, durability, design, and a reasonable price. After countless designs, prototype tests, and equipment development, Clover produced the Desk Threader. It has become popular not only with patchwork quilters or sewing enthusiasts, but also aged customers and housewives, in Japan, Europe, and America. Clover’s high quality and functionality have again gained the recognition of the world. Using the same know-how it used to create the high-quality needles, Clover has crafted a device that perfectly threads the needle every time. 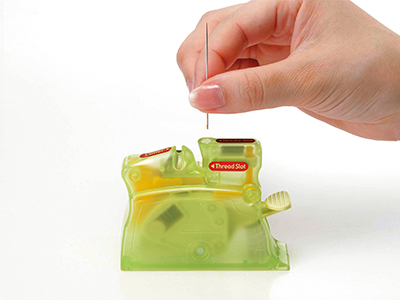 The Desk Threader can accurately thread Clover needles (0.51 mm – 0.89 mm width). 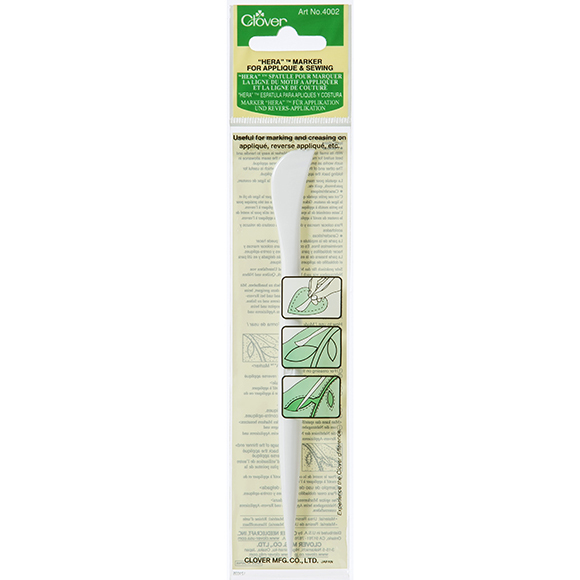 Use with quality-crafted Clover needles, which have consistent needle hole size. Simply set the needle and thread, then press the button. Difficult threading becomes quick and easy with the Desk Threader. With a stylish body and skeleton (half transparent) construction, the Desk Threader invites the user to peek inside and see the ingenious engineering it contains, and shows Clover’s confidence in its craftsmanship. Clover Achieves Function and Quality through In-House Development. Some years ago, I made many Yo-Yo with pale colors. 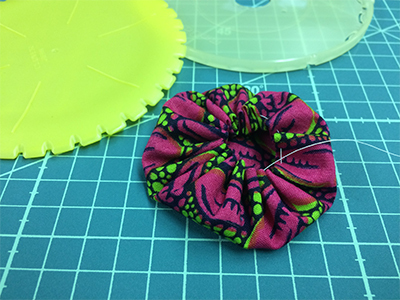 Now, I tried to make some Yo-Yo with wax fabric. Snice last year, I have seen many wax fabric in Europe and also they are available in Japan. You can make yo-yo easily with CLOVER's "QUICK" Yo-Yo Maker. 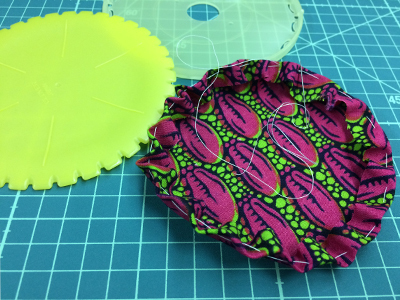 Cut fabric along with the plate by Bordeaux Ultimate Scissors. You can thread easily with Desk Needle Threader. 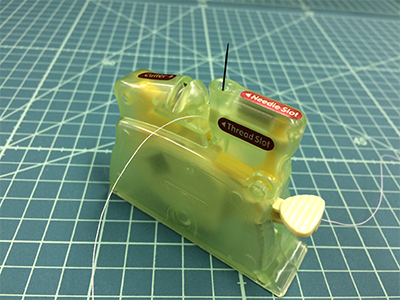 Start stitching with Black Gold Needle. Pull the thread and make fabric gathered. 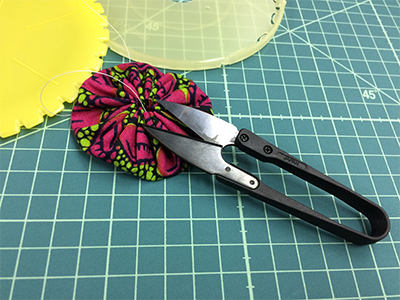 Make a knot and cut the thread with "KUROHA" Thread Clipper. Now, a Yo-Yo is finished! 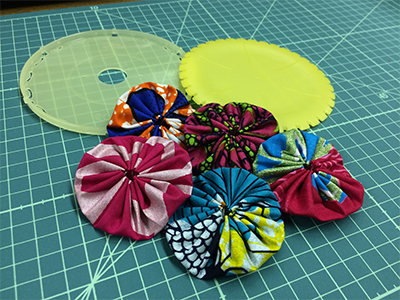 It's fun to make Yo-Yo with favorite fabric!